The TIS Alloy Forged F51P1 is a forged 1-piece polished wheel and is available in 22x12, 22x14 and 24x14 sizes. This wheel is only available for lifted truck applications. Free shipping on all TIS Forged F51P1 wheels. Free chrome spline lug kit with the purchase of a set of TIS Forged F51P1 polished custom wheels. 22x12 6x139.7 -51 F51P1-2228451L $700.00 53.5 Lbs -->> Call or email for special deals! 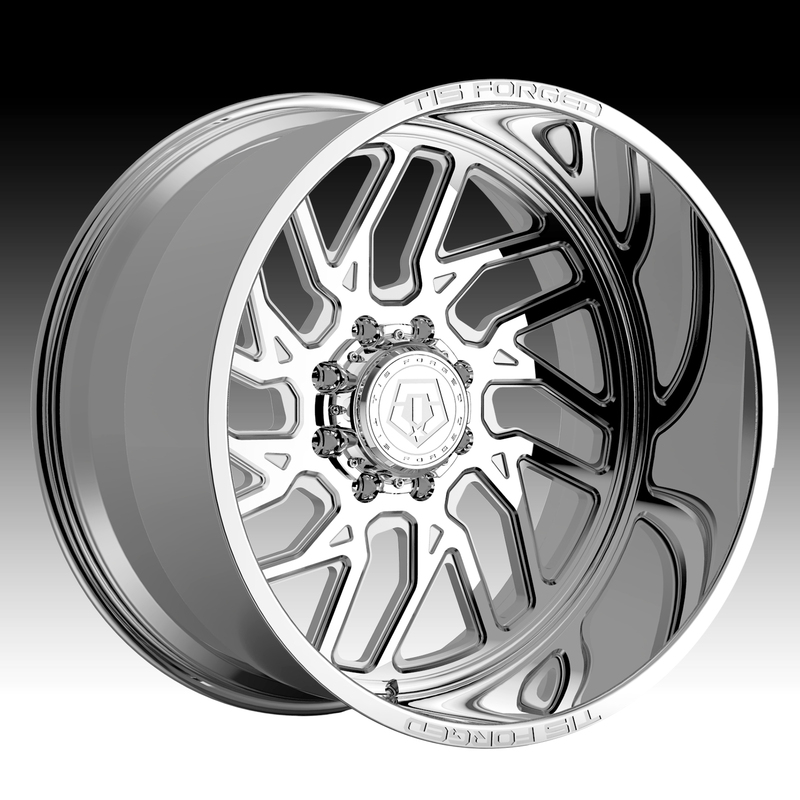 22x12 6x139.7 -51 F51P1-2228451R $700.00 53.5 Lbs -->> Call or email for special deals! 22x12 8x165.1 -51 F51P1-2228151L $700.00 53.5 Lbs -->> Call or email for special deals! 22x12 8x165.1 -51 F51P1-2228151R $700.00 53.5 Lbs -->> Call or email for special deals! 22x12 8x170 -51 F51P1-2228751L $700.00 53.5 Lbs -->> Call or email for special deals! 22x12 8x170 -51 F51P1-2228751R $700.00 53.5 Lbs -->> Call or email for special deals! 22x12 8x180 -51 F51P1-2228951R $700.00 53.5 Lbs -->> Call or email for special deals! 22x12 8x180 -51 F51P1-2228951L $700.00 53.5 Lbs -->> Call or email for special deals! 22x14 6x139.7 -76 F51P1-2248476L $775.00 58 Lbs -->> Call or email for special deals! 22x14 6x139.7 -76 F51P1-2248476R $775.00 58 Lbs -->> Call or email for special deals! 22x14 8x165.1 -76 F51P1-2248176L $775.00 58 Lbs -->> Call or email for special deals! 22x14 8x165.1 -76 F51P1-2248176R $775.00 58 Lbs -->> Call or email for special deals! 22x14 8x170 -76 F51P1-2248776R $775.00 58 Lbs -->> Call or email for special deals! 22x14 8x170 -76 F51P1-2248776L $775.00 58 Lbs -->> Call or email for special deals! 22x14 8x180 -76 F51P1-2248976L $775.00 58 Lbs -->> Call or email for special deals! 22x14 8x180 -76 F51P1-2248976R $775.00 58 Lbs -->> Call or email for special deals! 24x14 6x139.7 -76 F51P1-2448476L $875.00 61 Lbs -->> Call or email for special deals! 24x14 6x139.7 -76 F51P1-2448476R $875.00 61 Lbs -->> Call or email for special deals! 24x14 8x165.1 -76 F51P1-2448176R $875.00 61 Lbs -->> Call or email for special deals! 24x14 8x165.1 -76 F51P1-2448176L $875.00 61 Lbs -->> Call or email for special deals! 24x14 8x170 -76 F51P1-2448776L $875.00 61 Lbs -->> Call or email for special deals! 24x14 8x170 -76 F51P1-2448776R $875.00 61 Lbs -->> Call or email for special deals! 24x14 8x180 -76 F51P1-2448976L $875.00 61 Lbs -->> Call or email for special deals! 24x14 8x180 -76 F51P1-2448976R $875.00 61 Lbs -->> Call or email for special deals!